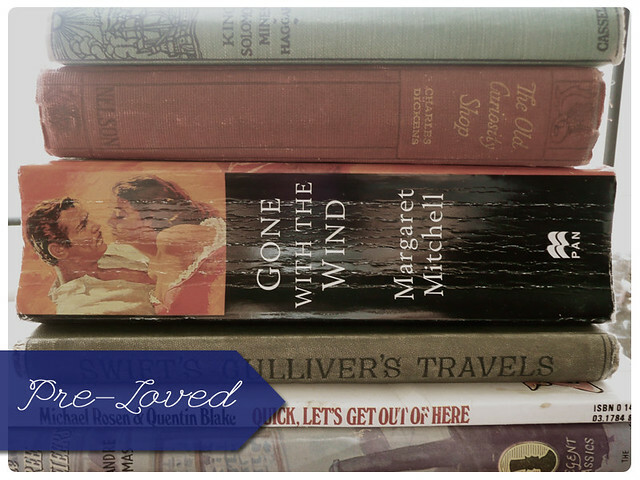 I want to talk about something which can be quite controversial for a librarian to discuss, and something which I think is really important nowadays, and that is the purchase and use of "pre-loved" books. A few years ago I was working for a well known high street bookstore, and as such I had a nice discount to take advantage of, that discount is really the main reason for that bookcase full of books in my to be read post. If you have a look at that picture you will notice that the majority of those titles are new, with only a couple of older, more used books in there. I pulled some of the older copies out to take the picture above to show a range of used books, but I really don't have that many. Whilst at the bookstore I became somewhat addicted to purchasing the books that I saw on the shelves and liked the look of, and because they came with a chunk off the price I didn't really worry too much. I was used to nice shiny new books, I loved the smell and the feel of a new book, the satisfaction of seeing a book go from being absolutely pristine to having a couple of cracks on the spine after the first read, to having scuffed corners and enough lines for the spine to resemble a tube map after being extremely well loved. There was just something about a shiny new book. Since university I have been making an effort to shift this bad habit, as I have found myself taking advantage of cheap offers on paperbacks, but I still feel the excitement when I hold a brand spanking new book now, even though I am much more open to the pre-loved book. So, I then decided that I wanted to be a librarian, and it hit me, I liked new books, not old ones, I liked to own books so that when I wanted to re-read them I could just reach onto my shelf. Now don't get me wrong, I have always and will always be an avid library user, but if I knew I would like something, or I had a strong feeling I would, I would always buy it instead of borrowing it. I often bought the first book in a series and then borrowed the rest, or borrowed a book and then bought it when I was sure it was a firm favourite. Obviously this isn't the ideal minset for a librarian so I started to think about why I felt that way and have concluded that it is mainly due to the way the world currently treats books. They are widely available to purchase at rock bottom prices, you can often grab them with all your other shopping at the local supermarket, even my village Co-op carries the best sellers. Our society is geared toward the easy purchase of books, so where previously someone would go to the library to borrow a book because if you were going to buy it you would have to pay £8, now people only have to pay £3, or as I did the other day, buy 2 books for £3. This to me is really quite shocking, especially as it has happened in such a short amount of time, in my lifetime in fact. Books have in a way been downgraded from something which was a luxury to purchase, and a privilege to loan, to something which is so easy to get your hands on that they aren't as desirable any more. No-one has to wait for a book, so the idea of waiting for a book to come through on order at the library, or checking your local charity shop to see if someone has donated one is alien. When you think about the items that children and teenagers currently covet the most, the majority of those items cost huge amounts of money, they have to have the latest item that can impress their friends, and they do that by flashing off their apparent riches with the most expensive trainers and games consoles. Gone are the days when a book could be something to look forward to and anticipate, to put on a christmas or birthday list and borrow in the mean time. They are the same as buying a bottle of pop and some sweets, so they appear to be less important to the youth of today. I am not entirely sure when this happened, but it does make me sad. Anyway, to get back onto second-hand books, after realising that I too was buying into this frivolous way of treating books I thought about how people used to get around the steep prices when they wanted to own a certain title. Obviously they used to buy second-hand. I didn't want to keep purchasing brand new books when there were plenty of titles out there pre-loved and just waiting for a new home. For new titles I will happily be put on a waiting list at the library, it isn't like I don't have plenty of other things to read, and I do still buy new books, but where possible I am trying to buy used, and am even making an effort to replace my new or nearly new paperbacks with second hand books in order to donate the nice new copies to the library. In particular I am doing this for my classics, as I can get some truly wonderful editions with beautiful covers, all of which far surpass the horrible Penguin Classics which dominated my university days. I buy from specialist second-hand bookshops (Oxfam Bookshops are especially good) library sales (that well loved Margaret Mitchell up there is ex-library stock) and charity shops ('Quick let's get out of here' is a book I have been searching for, for well over 5 years now, as I remember it from my childhood, and it was sitting in a local charity shop just waiting for me) and even ebay, and I will continue to for the future. One thing to note though is that I am quite particular about the copies I will buy. The hardbacks have to have a decent binding or at least be repairable, though I don't mind writing or doodling inside (in fact I have a lovely copy of Heidi which a child has previously used when playing teacher, the notes and ticks are really quite adorable!) and for paperbacks I don't buy if the book is particularly scruffy, as I want to still be able to add some age to it myself. They might not look as spectacular to photograph for this blog, but I think that the way a book has been treated is a testament to its value, and so I hope you don't mind that I will be reviewing library books and scruffy looking second-hand items. Hey, maybe this will even change a few attitudes towards pre-loved books also.